Learn about our schools and programs through the Catalog of Schools! 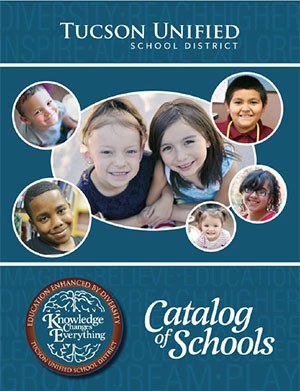 As the largest school district in Southern Arizona, Tucson Unified offers more unique learning opportunities than any other district in the region. We strive to deliver an educational experience that best fits the needs of your child. We provide a well-rounded and supportive academic environment at each of our elementary, middle, and high schools. Our academic and support services teams focus on nurturing the whole child, academically, intellectually, and socially. Whether your child would do best in a comprehensive school, magnet school, alternative school, or exceptional education environment, we are ready to work with you to select the right school for your family's needs. We also offer free full-day kindergarten at each of our elementary and K-8 schools! We are committed to making quality early childhood education accessible to our community. Additionally, TUSD offers fine arts, interscholastic sports, studies in world languages and a focus on STEM (Science, Technology, Engineering, Math) education. New to the district? Explore our school websites to find one that suits you. Or, call School Community Services at (520) 225-6400 to learn more about our schools and for assistance in making a selection for your child. We look forward to welcoming you to Tucson Unified!